Caulorhiza is an unusual genus, with only a few species worldwide. 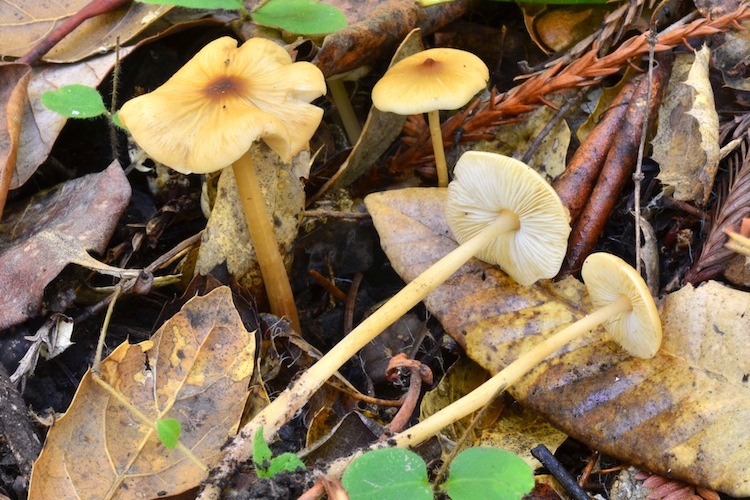 In our area, Caulorhiza umbonata's smooth, honey-tan to yellowish cap that is acutely to broadly conical, pallid gills, and white spore deposit do little to distinguish it from the throngs of other tricholomatoid/clitocyboid fungi. However, the stipe is distinctive - the cartilaginous-fibrillose texture, often strongly grooved/flattened cross-sectional profile, and most importantly the long, tapering taproot below the soil set it apart from other genera. Although it is not ectomycorrhizal, it appears to be among the most habitat-specific fungi in our area. It almost exclusively grows in redwood forests, very rarely occurring under pine or other conifers. Although only one species is known from our county, a few collections of unidentified taxa over the past five years seem to be miniature versions or ecologically different versions of our normal Caulorhiza. Whether or not this is actually the appropriate generic placement will require more research. 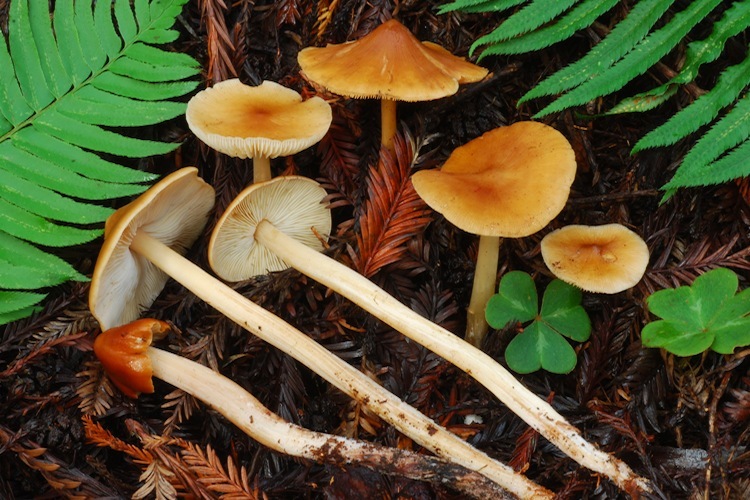 Important identification characters distinguishing this species are the peaked-conical cap, pallid gills, compressed/grooved slightly cartilaginous stipe, long, rooting slightly white-fuzzy stipe below the soil (excavate carefully, as this feature is easily destroyed), and growth under Coast Redwood.